I am my fathers daughter, as captured on camera. My Dad taught me how to have fun and enjoy every moment in life. I clearly gained my silliness from him, I love that guy. My Step Dad is simply awesome! You’re the best Step Dad ever!! My family would traditionally have brunch together to celebrate such occasions. Living in Hawaii and having more than 5,000 miles of the Pacific Ocean separating me from the both of them, it kind of makes it hard to meet for brunch. After chatting it up on the phone with the both of them, I decided to create my own Brunch for a party of one. 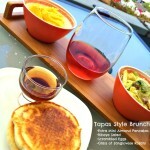 Tapas Style Brunch would be my stylo! Tapas is Spanish for snack size, appetizers, or bite size morsels. I’m all about having a sampling of everything, the Spanish are on the ball with dining tapas style. While Brunch is the combination of Breakfast and Lunch which traditionally occurs on Sunday’s and lasts till 3pm. Brunch started in the United Kingdom in the 1800’s and was later accepted in the United States in the 1930’s. Light libations are provided at Brunch unlike Breakfast. 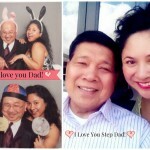 My Father’s Day Tapas Style Brunch is my way honoring my Dad and my Step Dad from a distance. As I was preparing everything, I remembered my Dad taught me how to make country style scrambled eggs, fluffy scrambled eggs, over easy eggs, etc. It made me realize my love for cooking started from him. He would talk about how things were done in the kitchen. Even till today we are always talking about cooking technique’s, what we’ve both cooked, or some old recipe Mom used to make back in the day. Today I wanted to sample a little bit of everything. 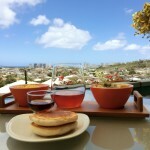 I made fluffy scrambled eggs, ribeye salad, and mini bite size pancakes. Although I didn’t have the fixin’s for a Bellini, I opted for a glass of Silverado Vineyards Sangiovese Rosato. It was perfect! I didn’t get overly stuffed and I didn’t have excess food to store. However you decide to celebrate your loved one’s today! As long as you get the chance to say, “I Love You!” and share how you appreciate them, that’s all that matters…..Near or Far!! Have a great Father’s Day Celebration today! Well said Myra……We miss your dad and step-dad.. Happy Father’s Day to the both of them. Thanks! I’ll make sure to let them know! I’m glad you enjoyed your time at my site. Hope to see you here again. Thanks for you feedback. Glad to have you visit again. Thanks for stopping by. I look forward to hearing more from you. Thanks for your feedback. Please stop by again. 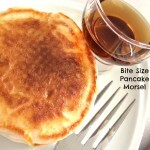 I just want to mention I am new to blogging and actually loved your web-site. Very likely I’m planning to bookmark your site . You absolutely come with wonderful writings. Regards for revealing your blog site. I have read some good stuff here. Certainly value bookmarking for revisiting. I surprise how a lot effort you put to make any such wonderful informative site.